Banjos have a reputation for being loud. That's probably because they are loud. For practice, lots of players like to use a mute to keep the volume down, for reasons obvious enough that we don't have to discuss them here. 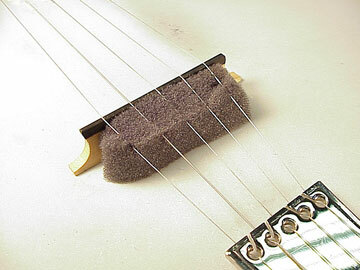 Most commercial practice mutes are devices that clamp onto the bridge, and all of them work just fine. Except that they tend to fall off. Or rattle. Some of them won't fit onto a compensated banjo bridge. Spring clothes pins work well as mutes, if you can get them to hang on without rattling against the head. 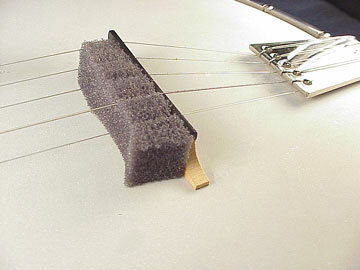 Here are five quick ways to mute the tone of a banjo, all of which cost nearly nothing, and are very reliable. Unlike commercial mutes, you can leave these in place and slam your case closed without breaking something! Actually the classic item is a folded up cotton baby diaper. (Presumably, banjo practice is not conducive to infant sleep.) I used a pink shop rag, and it worked just fine. 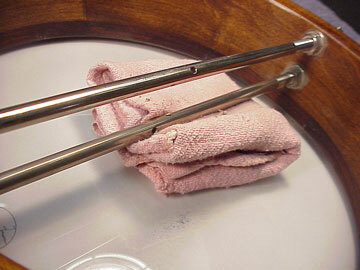 The tone can be varied a bit by folding the rag to fit tighter or looser. As you can see, a small V-shaped notch is all it takes to keep the thing in place. Here, I've used some of that charcoal gray foam used to line camera cases. If it fits fairly loosely, the intonation won't suffer much, and the volume and sustain are reduced dramatically. 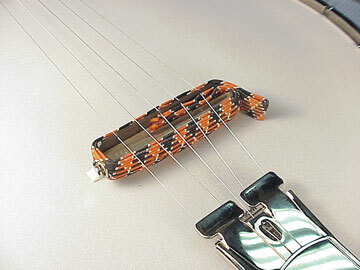 Just an elastic guitar capo, which, by the way, makes a great practice mute for violin. 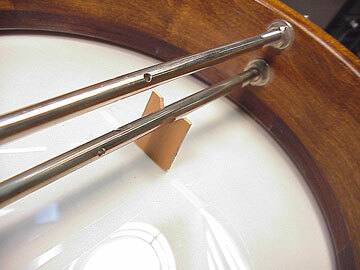 This mute quiets the instrument and increases sustain.